It’s estimated that there is 285 million visually impaired people around the globe, with 39 million of these classed as legally blind. Smart technology catering for their needs has been somewhat limited. Led by Eric Ju Yoon Kim, the South Korean tech company Dot wants to change all that. For the past 20 years, there have been no significant innovations in braille readers, despite them costing between $2000 and $15,000. They are also bulky and difficult to use, resulting in 95% of blind people giving up reading braille. When you compare the lack of advances in braille readers to mobile phones in the same time period, the difference is startling. We’ve moved on from those initial bulky handsets to modern smartphones that can complete a huge range of tasks. Dot’s mission is to create the same level of technology for blind and visually impaired users, by developing the world’s first smartwatch optimized for reading braille. Many blind and visually impaired people find accessing normal activities such as texting, checking Facebook and messaging friends a challenge, but Dot aims to make this more accessible. 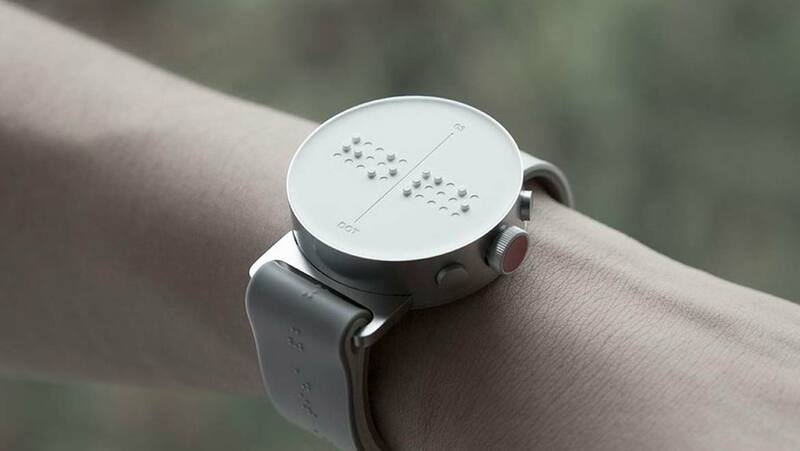 In order to create the smartwatch, it was necessary to completely reimagine the current technology for reading braille electronically, on braille readers. These readers use piezoelectric technology which is too bulky to incorporate into a smartwatch. Instead, Dot uses 24 Touch Sensors which are magnetically controlled. The sensors link to four braille characters which are revealed as the dots rise and fall. Dot is made from lightweight aluminum and has a battery life of seven days. The inventors specifically wanted to make Dot accessible and affordable, so have set a price of $290. Dot connects to your smartphone via Bluetooth and can receive any text or message from any application, including messages, emails, notifications and directions. Of course, it also contains all the standard options you would expect from a smartwatch including a timer, stopwatch, alarm, accelerometer and gyroscope. When a call is coming through to the attached smartphone, the Dot watch vibrates and displays the name of the caller on the braille readout. Using the buttons on the side, users are also able to send short replies to emails and messages. The creators of Dot have made it an open system, meaning anyone can write programs for it, putting a wealth of information at the fingertips of users. Potentially, Dot can be used for smart home control, image to text translation, weather, news, transport and navigation, social networking and more. Whilst it might not be the most practical device for reading long messages, given that it can only display four characters at once, it is a significant improvement on previous technology and the company already has 140,000 preorders. The release has hit some delays due to some adaptations required due to the challenges of protecting the small moving parts whilst also ensuring they remain tactile. Dot is aiming to ship 100,000 watches in 2017 with another 40,000 in 2018. Another 1,000 watches will be available to buy at retailers in London. The creators are also working in collaboration with Google on something that they’ve dubbed the ‘dot pad’. This is similar to an e-reader in size, with a screen made of up of tactile moving dots. This will be able to display shapes and images as well as text. It seems that Dot has sensed a gap in the market and is working hard to provide life-changing technology for blind and visually impaired users. This could be especially useful for young people with visual impairments who may feel cut off from technology and disengaged from learning to read braille. Dot is hoping to ensure that nobody is left out as technology continues to change at a rapid pace.